The Monday after FC, Hegdish and Drake came by Trey's place so we took the opportunity to get some photos. In particular, I finally got pics of Hazrat and SatRat together! 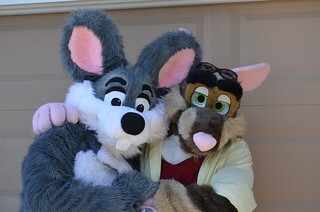 Yay, ratty buddies! 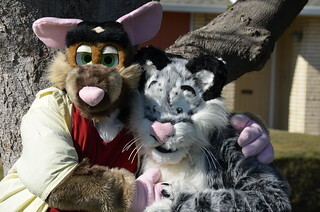 Also got some really cute photos with Trey's spottycat. I still think Widge's eyes are the cutest. =:) Even if, I recall, it proved to be a bit of a hassle keeping them from misting up. Have you tried anything similar since? I wouldn't mind trying something robotic in the future, which would be well served with solid, glossy eyes. Haven't done solid eyes for a long time because of the fogging problem. You can use some de-mist treatments but it's messy. If you do solid eyes, I'd put lots of vent holes hidden around the top of them.